The Osoyoos Community is located in the centre of the Okanagan-Similkameen region and is one of the major 4-season Resort Town’s in the South Okanagan Valley. Osoyoos is more than a place, it’s a way of life. 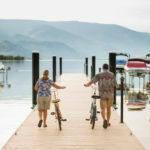 With the warmest temperature’s in Canada, picturesque landscape, and friendly community, it is no wonder more and more people are choosing to live and work in Osoyoos, BC. The Osoyoos Community has a multitude of recreational facilities including hockey and curling arenas, pickle ball and tennis courts, baseball diamonds, recreational water parks and more! Not to mention many clubs and community groups that appeal to a multitude of interests. When combined with our labour pool, strategic location, infrastructure, and low overhead costs, Osoyoos’ ability to retain and attract new industry is unparalleled. Over the next few years, economic development in Osoyoos will be solely focused on diversifying the current economic offering to establish multifaceted, year-round economy for tourists, entrepreneurs, investors and residents alike. The diverse economy of Osoyoos supports construction, health care, and retail growth sectors with emerging sectors in film and aerospace. Agriculture, viticulture, tourism and hospitality are long established industries for the region. Osoyoos continues to diversify its economy building upon well-established economic strengths in, agriculture & ecotourism, all-season recreation, and hospitality.